Our energetic class is designed to help you rediscover your strength and flexibility after pregnancy. This class is well-balanced and explores poses including backbends, inversions, twists and core strengthening. Barb helps each student find what’s available within their personal yoga practice and offers modifications to poses so students can practice in harmony on their own level. Students can attend as early six weeks after birth (or once your doctor gives you clearance). Some of our regular students had their children over twenty years ago, which means all Moms are welcomed. This fun class has a steady flow. It will leave you feeling accomplished and rejuvenated. We invite you to take this much-needed time for yourself. Prior yoga experience is not necessary, as classes are tailored to individual needs. This class is suitable for men and women. 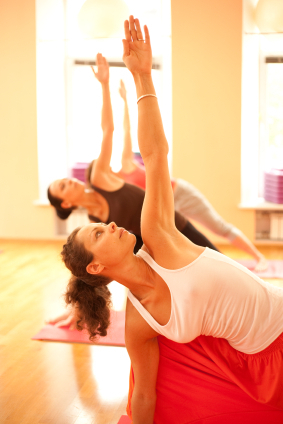 You can drop-in for any of our yoga and fitness classes. Advance registration is not necessary. Check our Weekly Schedule for our regular class schedule.